If you would like to share important information with someone but you don’t want to risk it falling into the wrong hands, consider contacting an attorney so that you can learn how to set up a confidentiality agreement. 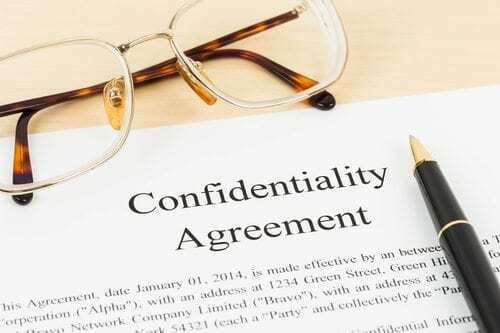 Establishing a legal contract between two or more parties, confidentiality agreements outline information, knowledge, or material that is intended to be kept secret. Both parties must agree not to share the outlined information with anyone else. If you’re interested in developing such a contract, you should contact an attorney. Sometimes a confidentiality agreement restricts the actions of all parties involved, mandating that they not share the confidential information outlined. This typically refers to two parties, but it can include multiple parties, and it is known as a bilateral agreement (between two) or mutual agreement (between more than two). In other cases, the agreement will only restrict the actions of one party. For example, a company working with a contractor might set up a confidentiality agreement to ensure that the contractor is not legally allowed to share the company’s techniques, plans, and clients. A one-way contract is known as a unilateral agreement. Confidentiality agreements go by many names: non-disclosure agreements (NDA), confidential disclosure agreements (CDA), proprietary information agreements (PIA), and secrecy agreements (SA). The various titles do not affect the nature of the contract. Many confidentiality agreements will include a clause to protect the person who has received the information and is bound to keep it secret. Typically this clause will specify that if the party can lawfully obtain the secret information through another source, they are no longer obligated to keep the information secret. Although a confidentiality agreement can arise from a variety of situations, it is most commonly used when two parties are considering doing business with each other. The two parties could be companies, individuals, partnerships, organizations, etc. The contract ensures that the disclosing party feels comfortable trusting the other with important information. To create a confidentiality agreement that is legally binding and includes all of the necessary information and clauses, you will need to work with an attorney. If you live in southwest Missouri, contact Carnahan, Evans, Cantwell & Brown, P.C. We have represented dozens of employers and employees, so you can feel comfortable trusting us with all of your business contract and litigation needs. Whether you need to create a confidentiality agreement or solve a dispute involving one, our lawyers’ experience, expertise, and dedication will help you achieve a successful outcome. Give us a call at 417-447-4400 or contact us online.